Last Updated: 2nd Feb, 2019. Many 9th Class Pakistani students are looking for the notes of Pak Studies in Urdu and English fwhere they can prepare for the exams and get great marks. We tried our best to provide you the best experience so that you don't need to open many pages to download your desired notes. It can be downloaded with a single clink or even you can view online if you have don't have a PDF reader. It's according to the new course of Federal Board (FBISE) before that there was no Pak Study book in 9th Class. The notes can also be used for Punjab Board and others that have the same syllabus. Students will have good concepts about Pakistan and the affairs discussed in the book. It is important to know the ideology of Pakistan, what was the main purpose to make Pakistan separate. You might be thinking why it is critical because our youth have forgotten the difference between India and Pakistan. These notes would help you clear this concept. It is all told in the first chapter. Then you will find out the difficulties Pakistan faced in the second chapter. How millions of people who migrated from India to Pakistan how they were helped. How Quid-e-Azam helped theme by establishing Refugee Fund. In the third chapter, you will come to know which country is the north, south, east and west. The last chapter is more important where constitutions of Pakistan are depicted. These notes are one of the best notes in the market that can help you in getting great marks in exams. 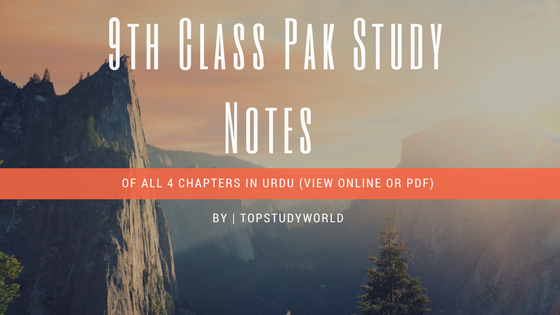 Are you trying to find the 9th Class Pak Studies Notes in Urdu and English of all the 4th chapters according to the new course of FBISE? You have come to the right place.